Can a Trade War Really Cause a Shooting War? “Get ready for an all-out financial war between the U.S. and China. Germany is also in the crosshairs…. Trump has already torn up the TPP trade agreement and has put Canada, Mexico, and South Korea on notice that their trade deals need to be renegotiated. 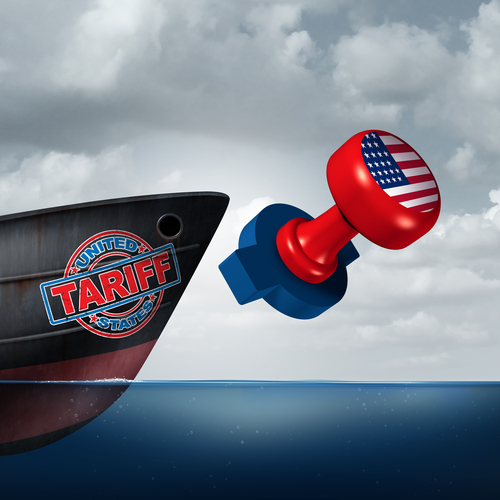 A full-scale trade war is now upon us. (emphasis mine) It will shake markets and be a major headwind for world growth. It will get ugly fast and the world economy will be collateral damage. On to Part II. When it comes to what causes wars and what really happens, Richard is the expert. DENNIS: Richard, I love how you explain the geopolitical military events in understandable terms – something we rarely read about. You coined the term “Chaostan”. Can you explain what you mean? RICHARD: Chaostan means the land of the great Chaos. It refers to Asia, East Europe, and North Africa. After its 1776 revolution, America became the most free and prosperous nation ever seen on earth. People abroad saw this and they too wanted freedom and prosperity. So, they launched revolutions to implant the American legal principles in their countries. The principles were spreading around the world until socialism came along in the late 1800s and stopped them. The most important area that never got the principles is Chaostan. It had been a place of tyranny, bloodshed, and poverty since the beginning of history, and still is. 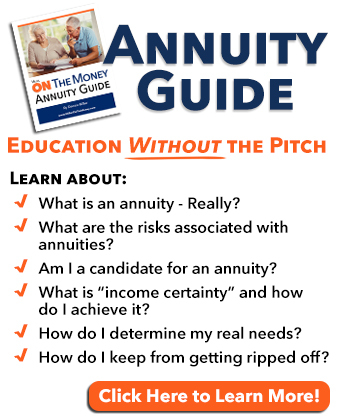 We do not sell annuities. This is an educational report. DENNIS: When did you coin that word? I’ve always seen you use it. RICHARD: 1992. In Early Warning Report I began repeating, in almost every issue, that if the politicians and bureaucrats in DC didn’t stop meddling in Chaostan, America would be drawn into its many ancient vendettas. DENNIS: What an amazingly accurate prediction. RICHARD: In 2009, Newsweek reported that my Chaostan model had been adopted for strategic planning in the Pentagon and CIA. But, of course, by then it was too late. DENNIS: The time we met I mentioned my “goals of war”. They are not only to destroy the enemy but also their will to fight. We discussed the beliefs of much of Chaostan, and how it’s impossible to destroy their will to fight – it’s ingrained into their culture. By engaging in battles in Chaostan, it likely means perpetual war. While I am proud to have served my country, today I struggle with the way the political class is using the military. If the Pentagon is using your Chaostan model for strategic planning, it would make sense to find a way to unwind the US from our worldwide meddling. How would they ever get out of the mess? Do you ever see that happening? RICHARD: When it will happen, I can’t guess. How is a different matter. I think it is likely the U.S. Empire will disintegrate in much the same way as the British, French, Russian, Roman, etc. At some point, the armed forces will figure out they’re risking their lives not to protect their country but to help the power junkies in the capital feel the thrill of victory. They’ll tell the power junkies, we will defend our homes and families within our borders, but we will no longer march off to foreign lands to fight with people who are your enemies, not ours. It could be something as dramatic as the end of the Russian Empire. Russian troops were sick of fighting Germans for the Czar, and one day they just turned 180 degrees, marched back to Russia, and helped get rid of the Russian government. DENNIS: Wow! I never realized that. I guess only Switzerland has figured out the solution. Let’s talk about investing. 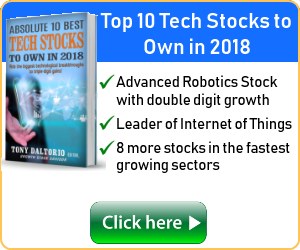 Unlike most investment newsletters, you are unique in recommending defense contractors. Your recommendations have helped my retirement income for sure. Regardless of the economy, or the political situation, they seem to thrive. When Apple develops a new technology like an IPad they must create a new market. When it comes to defense contractors, they’ve been developing new technology for decades – with a market anxiously waiting to spend billions of taxpayer dollars on their products. With tough economic times ahead, do you still recommend defense contractors? RICHARD: Certainly. Long ago the defense firms realized that political power corrupts the morals and the judgment. As Washington’s power grows, the key to mountainous profits is to bet on ever more stupidity and corruption in DC. That’s what the defense industry is. The whole thing is a huge bet that federal power junkies will get into more of other people’s wars. And as long as the federal government keeps acquiring more power, it will continue becoming more asinine and crooked, and more prone to stick its nose into ancient feuds in Chaostan. RICHARD: If you look at the investment behaviors of the defense firms, you’ll see a pattern. They’re constantly pouring billions of their own dollars into research and development. Why? I think because they know U.S. foreign policy since McKinley in 1898 has been to roam the world poking sharp sticks at rattlesnakes. Especially in Chaostan. War is the most thrilling use of political power. Like the ancient Roman rulers, the power junkies in DC are addicted to it, and the defense firms know it. They continually make their existing products obsolete and invent new technology because there will be a very profitable market for it. To me, long-term investments in Lockheed, General Dynamics, and the others are slam dunks. DENNIS: How do you know all this? RICHARD: I’m the voice of experience. In the 1960s, I was a member of the 605th Special Operations Squadron. We worked alongside the CIA’s School of the Americas, helping train the troops of Washington’s pet dictators. That’s a main job of special ops troops around the world, and it’s why the swamp never runs out of enemies. Its tyrannical allies hurt a lot of innocent people. DENNIS: Wow, that is the belly of the beast. I know some former CIA, black-ops types and you all share a similar message. Back to investing. One final two-part question. In your recent issue, you’ve outlined major flaws in using Gross Domestic Product (GDP) as a gauge for economic health. Can you please elaborate? Our readers are trying to protect their nest egg. What should they use for reliable data? RICHARD: Hard to give a brief answer to that. You are referring to the March Early Warning Report. Summarizing it, to calculate GDP, the swamp’s bureaucrats add up all sales in the U.S. This is extremely misleading. For example, when hurricanes flatten a city, the sales of materials and labor for rebuilding go into the GDP as progress, while the value of what was destroyed is not subtracted. That’s the case throughout the economy. When something good happens, it’s added to the GDP to show progress, but when something bad happens, it’s not subtracted. A wise investor should never believe GDP. One thing you can believe is prices. Not the swamp’s price indexes, but actual prices. Keep your own price index. Make a list of dozens of goods and services you purchase regularly and update it occasionally. This will give you a much more reliable picture of whether or not we are in an inflationary boom. Also, pay attention to the various consumer confidence indexes compiled by private organizations. When consumers feel optimistic, they spend more, and money changes hands more quickly. This acceleration in the velocity of money has the same effect as an inflation of the money supply, it causes a boom. DENNIS: Interesting suggestion. As I was preparing our taxes for our CPA, I compared the cost of eating out over the last few years. We’re not eating more calories, but prices have gone up over 20%. I want readers to know I have no financial arrangement with Richard or his company. I’m happy to recommend his “US & World Early Warning Report” in exchange for him kindly taking his time for our benefit. RICHARD: My pleasure, Dennis. And please let me say, you give your readers a view of the facts that isn’t forced into the mainstream mold. You have my personal thanks for a job well done. DENNIS: Thank you, I appreciate your kind remarks. Concerned about possible high inflation? 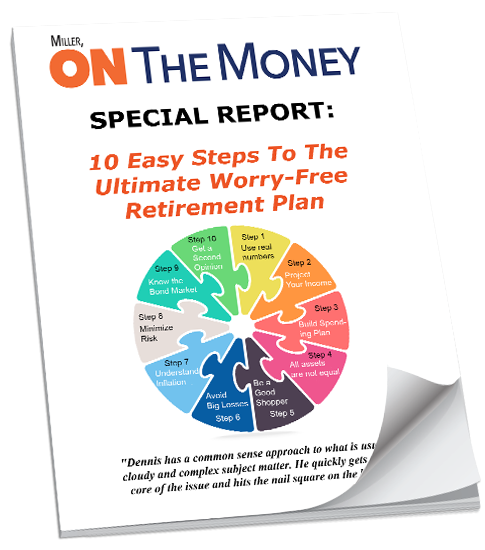 Need to protect the buying power of your nest egg? During the high inflation Carter years, gold prices rose ahead of the inflation rate. 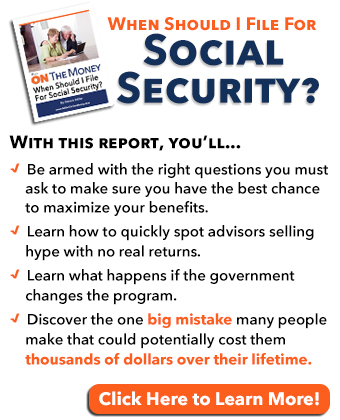 Baby boomers and retirees want adequate inflation protection, for the lowest possible price. 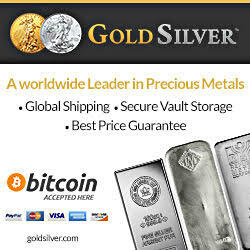 Our affiliate Goldsilver.com offers a “best price” guarantee. Dennis here. Let’s hope some common sense enters the picture and we don’t repeat the mistakes of the past. As always, prepare for the worst and hope for the best. Defense stocks may not be as glamorous as Apple or Facebook, but they have performed well. I still keep my stop losses up to date. Last week we went to a Cub spring training game in Surprise, AZ which is not too far from the local air force base. The air show was last weekend. Out of nowhere came a huge roar and the crowd started cheering. The Blue Angels flew over a few times in a very tight formation. No matter how many times I’ve watched them perform, I still find it exciting. I served in the Marine Corps in the air wing, so I’m probably biased. 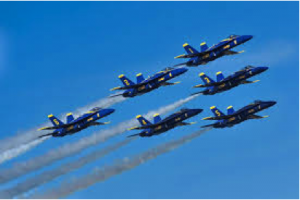 In our younger days, we lived in Pensacola just outside of the Naval Air Station where the Blue Angels are based. Jo was driving along Barrancas Ave. just outside the gate. She was wearing a pretty summer dress and the top was down on our Mustang convertible. She was startled by a huge roar and her chest was vibrating from the sound. She looked up and there was a Blue Angel plane, upside down, checking out the chick in the convertible. The pilot waved, Jo waved back and then he shot straight up in the air. What a thrill it was! If you have never seen them perform, here is a LINK to their schedule. I suggest you check them out. Coffee (N.), the person upon whom one coughs.